Here's a soup idea for those of you (like us) currently experiencing some very cold temperatures. In weather like this a cold sandwich for lunch really doesn't hit the spot: you need something hot. This soup is ridiculously easy to make and uses only store-cupboard ingredients. Approx 200g dried lentils - of 4 or 5 types (this time I used Red Lentils, Yellow Lentils, Mung-beans and Green Split Peas). If you want to use larger pulses, such as beans, you may have to soak and pre-cook them. Making this nutritious, healthy, warming soup is almost as easy as opening a can, but the end result is 100 times nicer! I keep thinking that Spring is just round the corner. We have had a couple of spells of milder weather; a few really bright sunny days with blue skies. But then it reverts to Winter again - like the last few days, when it has been very cold once more. The poor old plants don't really know what to do. I have had buds on my Daffodils for nearly 6 weeks now, but they are mostly still firmly closed. The Buddleia is covered in new shoots. This year I am going to try to persuade it to grow a little more upright. Last year the long branches made it top-heavy and the shrub is very lop-sided. It may need staking. The prunings that I pushed into the soil around the parent plant look as if they have probably rooted. There is also plenty of new growth on my white Rose bush. If only it would stay looking this fresh and healthy! It suffers every year from Black Spot. The leaves all fall off and the bush has to start all over again. Despite that I usually get a very fine display of flowers. The ferns are gathering their strength too. I recently cut back all of last year's growth, which had been sheltering the plants over the Winter, to make room for new fronds. Each one of these hairy bumps will in due course unfurl as a new leaf, and it looks as if there will be plenty this year. The fruit trees are also showing signs of life. This is a bud on the "Conference" pear tree. Last year I worked hard on pruning my tree (which is grown as a Minarette - very slim) correctly, so I'm hoping that it will do well this year. I absolutely love pears, and being able to have some from your own garden is especially rewarding. I trimmed about three feet off the top, because the bush / tree had got so big that it was blocking out much of the morning light! This makes me think: why does anyone use dried Bay leaves when they could use fresh ones? Dried Bay leaves seem to me to taste of not a lot, whereas fresh ones are very fragrant indeed. How lucky we are to have such a massive supply of fresh leaves just a few steps away from the kitchen door! This is a plant with which you need to be careful. It is very vigorous - you might say invasive - it sends up suckers all over the place, so only invite into your garden if you're ready for this. Fortunately the suckers are relatively easy to pull up as long as you get them when they are young. My Euphorbia is probably about 10 or 12 years old now. I don't remember exactly. I just remember buying a little pot of it at a Farmers' Market in Alton once upon a time. I think it cost me £1. And of course it has expanded over the years so that it is now quite a large patch, even though I regularly pull up loads of it every year. It's a good plant for awkward spaces, because it will tolerate poor soil and low light-levels - mine is in such a place. The opening of Crocus flowers is practically synonymous with the advent of Spring. That little splash of colour is so welcome after weeks and weeks of dreary grey Winter! This purple Crocus is one of a clump that has established itself at the bottom of my garden, at the base of one of my compost bins. I didn't plant them there - they just moved in of their own accord. Maybe a corm fell out of my hand as I took a handful of garden debris to the bin? This next photo demonstrates how eager the Crocuses are for a bit of warmth - leaning over in unison, pointing their heads at the sun. Just beginning to open, ready to soak up the rays. This is a different type. It has very pale spindly flower-stalks. I don't know its name, because it's another volunteer, but after reading a blogpost the other day on Hillwards, I now think they are Crocus Tommasinianus, sometimes called simply "Early Crocus". I hope soon to be able to show off some Crocuses that I have actually deliberately planted. Mine are mostly in pots so that they can be moved round the garden to wherever I want them. After a year in pots like that they will get transplanted into a border somewhere, or at the base of one of the trees, so that they can become "naturalised". "Flour Water Dirt and Rain is a food and garden project/blog based in Ballinspittle, West Cork, Ireland. 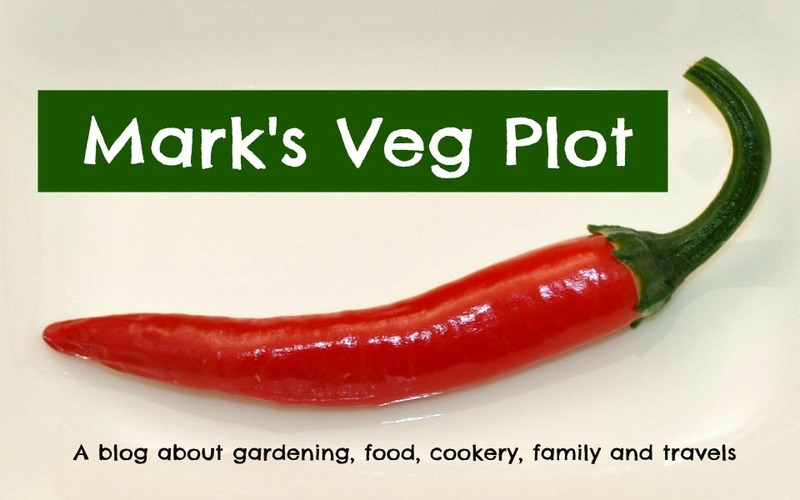 this blog works with new ideas in gardening, cooking and DIY. the project emphasises on working from scratch and getting to the basics of how we live and what we eat, by creating delicious, healthy and exciting food from the dirt up." That's what a good piece of outdoor-reared pork should look like: some lovely dark meat, but also a nice thick layer of fat beneath the skin. Not soft flabby fat, but firm hard fat, which will ooze into the lean as it cooks, keeping it tender and adding loads of flavour! We decided that it would be best if I were to cook the pork simply, so that we could enjoy it for the fine piece of meat it was, but that I should try to do something different in the vegetable department to accompany it. Later on these were browned in the oven for about 40 minutes while the pork was cooking, and ended up like this - crispy on the outside, soft in the middle. Meanwhile, I removed the chine-bone from the meat and used it to make a gravy for later on. My method for cooking the pork was "standard" - about half an hour at high temperature to make the skin form "crackling", followed by about 45 minutes at a lower temperature. Finally, about 15 minutes of resting time. It is hard to carve a piece of meat like this into slices, so I just cut between the bones and separated it into slabs like chops! Towards the end of the meat's cooking time I steamed some other vegetables - carrots, broccoli, Swede turnip and Cavolo Nero - browned the Mashcakes and heated up the gravy, so that everything was ready at the same time. This is the traditional British way to eat: "meat and two veg, with gravy" (except in our case rather more than two veg!). The meat certainly lived up to expectations. It was tasty and moist, not dry like so much of the pork you buy in the supermarkets these days. The crackling was not as crispy as I would have liked, but it was still OK, and full of flavour. Making pork skin crackle seems to be a very hit-and-miss affair. We have tried all sorts of techniques over the years, but none of them is infallible. Do any of you have any foolproof techniques you would like to share with me? Jane is cooking the Venison this evening, so I expect you will be able to read about it on Onions and Paper very soon.. The other day I saw on A Whole Plot of Love a post about the supermarket Aldi offering fruit trees for £3.99 each... This was an offer that sounded too good to miss, so I went along to see for myself. The trees certainly looked very good specimens, and at that price it seemed foolish not to buy one. At Jane's suggestion I bought a "Bramley" apple tree, because if in due course it produces fruit this will be the most useful type for the kitchen. I'm sure most of you know that the Bramley is the best cooking apple of all - it "falls" (disintegrates) very well when cooked, producing a lovely smooth puree. Anyway, such things are a long way off still! It will probably be a couple of years before we get a viable crop. The label says that my tree will grow to between 6 and 10 feet - it must be grafted onto a miniature stock - so I have planted the tree by the fence, over near the minarettes. The tree I chose has a particularly long leader (the main growing stem), so maybe it will eventually be very tall. As you can see in the photo below, the tree is already taller than the fence, and the fence is 6 ft. Here's a close-up. There's not much to see at present, but at least you can see that I have provided the tree with a hardwood stake, to which I have strapped it with a couple of sturdy plastic ties. Now of course as all gardeners know, it is impossible when shopping to buy just the thing you went out to buy, so I must now admit that whilst buying the apple tree my eye also lit upon some packs of Rhubarb plants which were nearby... At a mere £1.99, how could I resist? It's a pack of 2 plants of the "Timperley Early" variety. When I say two plants, I mean two chunks of plant evidently sliced with a spade. I'm not complaining though, since they seem very vigorous and are already putting up a couple of lovely strong and colourful stalks. This variety has really bright red stalks - though they will be pale pink if artificially forced. They have already been planted, so that they have the maximum opportunity to settle in. I'll not harvest any stalks from them this year though. I'll wait until next year, by which time they should be well established. I never cease to be amazed by the economics of the supermarket. How on earth do they manage to sell a decent-sized, healthy, well-packaged fruit tree for as little as £3.99? How much do you think they pay the grower? This is the star performer: chicken satay, cooked to perfection on our electric tabletop grill. Kept nice and juicy by their marinade, but with some well-done stripes too! Naturally, beef or pork would work just as well. You perhaps know that I don't eat fish or seafood, so you're probably wondering about what I think of prawn crackers. Well, I find that they usually don't taste of prawns - just a sort of salty savouriness, so I'm fine with them. Then there is the Gado-Gado (literally just "vegetables"). This is what a Westerner would call a salad. Our version is made with some raw ingredients and some cooked ones. 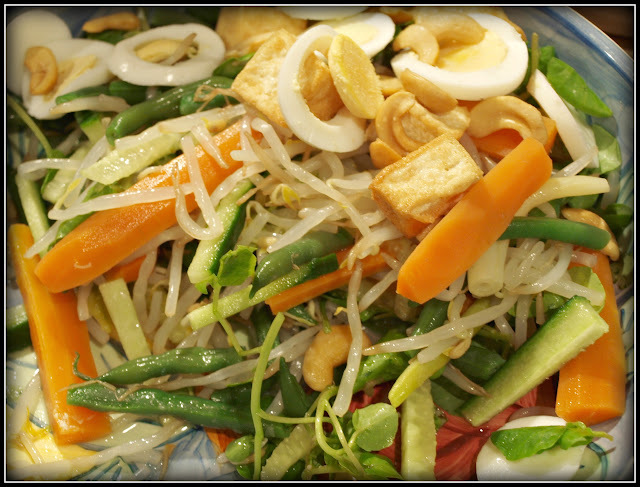 We use carrots, green beans, beansprouts, cucumber and watercress, topped with fried beancurd (tofu), cashew nuts and sliced boiled eggs, but of course you can use pretty much anything you fancy. These are steamed buns filled with red-cooked pork. As it happened they were rather ordinary, and were completely overshadowed by the home-cooked elements of the meal. This meal wouldn't be complete (or authentic) without rice so we had some fluffy fragrant steamed Basmati too. Finally then, the obligatory arty shot! That just reminds me how nice the fried tofu was. Lovely and golden on the outside but soft and fluffy on the inside. I think you can see why this meal is a favourite of ours. Interesting, good-looking, healthy and nutritious. We've had it many times before, but I'm sure we'll have it many more times in the future too. Regular readers will know that the emphasis in my garden is on vegetables rather than flowers, but I do still have at least some flowers and shrubs. I am currently enthused by the Aquilegia (aka Columbine). Last year I grew some Aquilegias from seeds sent to me by the ever-generous Diana of Kebun Malay-Kadazan Girls. I sowed the seeds too late in the year for the plants to flower, (you can read about it HERE), but I am hopeful that this year I will get some blooms. I am particularly looking forward to this because I still don't know what type / colour they will be. The six little plants that I had potted up had died right down, and were looking decidedly scruffy, but nevertheless they have successfully survived the Winter and are just putting up their first new leaves. I tidied them up, removing all the leaf-stalks from last year along with all the accumulated pine-needles, birch leaves etc, and then re-potted them. 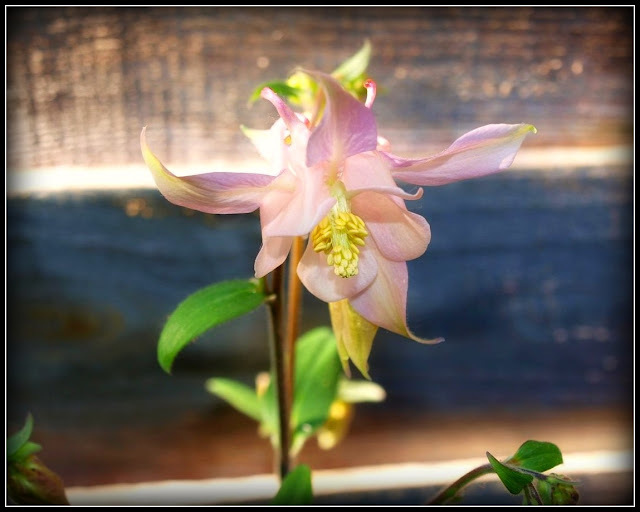 Growing them in pots means I will be able to move them around the garden at will, whereas in the past my Aquilegias (until now only self-seeded volunteers) usually grow in a very unlikely place - alongside the fence between my back door and the compost bin! Now I hope I won't regret this. I have no idea what colour(s) the flowers of these plants are going to be, and I suppose it is entirely possible that they will clash horribly with the red and brown of this pot, but I'm taking a chance on it. 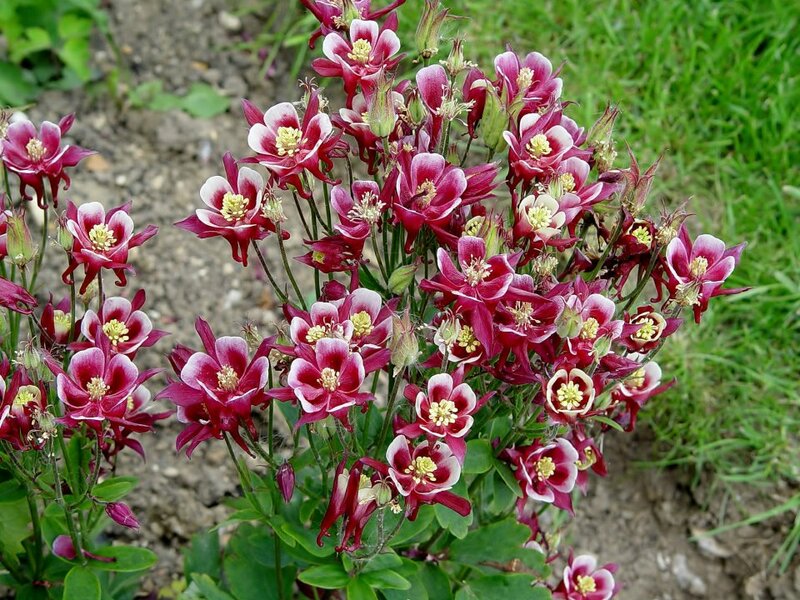 This year I am growing another batch of Aquilegia from seed. The seeds were sent to me by David Ford of Wellcome Allotments, another blogging / Facebook friend. David is not only an avid gardener, but also a very accomplished photographer, so of course he had the foresight to send me a photo showing me what to expect! My salad had the following ingredients: two types of crinkly tangy, slightly bitter Radicchio (plain red, and variegated), long thin crunchy leaves of blanched chicons of Witloof chicory, softer bright green peppery Watercress, and home-grown peashoots - succulent and intensely pea-flavoured. This meal is typical of our weekday meals these days. We have been making a conscious effort to eat less meat- mainly because good (local butchers') meat is very expensive, and ordinary (supermarket) meat is often very disappointing. Each week we try to have at least one meatless dinner (not vegetarian, because we eat cheese and eggs and suchlike instead). Since good vegetables are easier to find than good meat (for example, in my garden!) 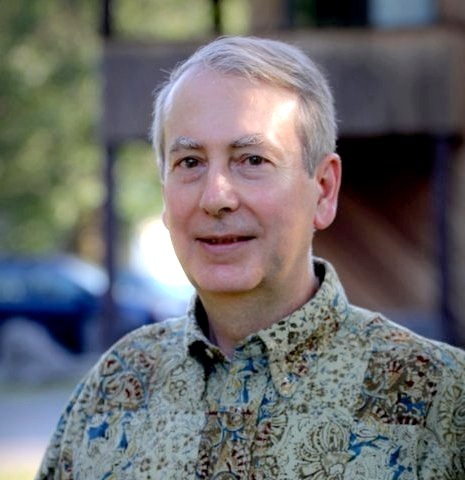 this is no penance at all, and we often end up eating meatless meals two or three times a week, not just once.